Scientists from Moscow State University (MSU) working in an international team of researchers identified the structure of one of the key regions of telomerase – a cell immortality enzyme. Structural and functional studies on this protein are important for the development of potential anticancer drugs. The results of the study have been published in the highly-rated Nucleic Acids Research journal. To provide its descendants with an exact copy of its genetic material, each cell goes through DNA replication before division. This is a precise and fine-tuned process controlled by the coordinated work of a sophisticated enzymatic machinery. However, eukaryotic cells have a problem with replication the terminal DNA fragments: due to the nature of the copying process, the termini of DNA molecules are left uncopied, and DNA becomes shorter with each replication. However, no important data is lost in the process, as the termini of DNA molecules (telomeres) consist of thousands of small repeated regions that do not carry any hereditary information. When the reserve of telomere repetitions is exhausted, the cell ceases to divide and eventually it can die. Scientists believe that this is the mechanism of cellular aging, which is necessary for the renewal of cells and tissues of the body. But how do "immortal" strains and stem cells that give life to a huge number of offspring cope with this? This is where the enzyme telomerase comes into play. It can restore telomeric termini of chromosomes and therefore compensate for their shortening during mitosis. Telomerase protein catalytic subunit works together with the RNA molecule, and its short fragment is used as a template to synthesize telomeric repetitions. MSU-based scientists discovered the structure of the telomerase fragment that is in charge of this process. 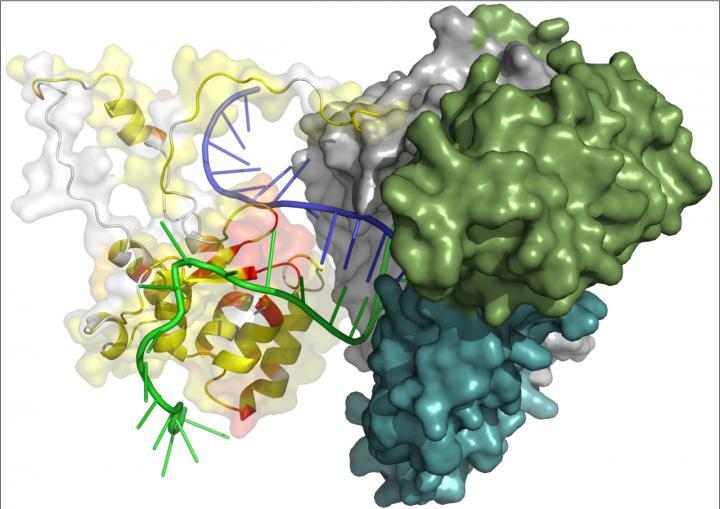 "Our work is aimed at the structural characterization of the telomerase complex. In a living cell, it includes a catalytic subunit, an RNA molecule, a segment of telomeric DNA, and several auxiliary components. Genetically caused anomalously low activity of telomerase can result in serious pathogenic conditions (telomerropathy), while its anomalous activation is the reason for the cellular "immortality" of most known cancers. Information on the structure of telomerase and the relationships between its components is necessary for understanding the function and regulation of this enzyme, and in the future – for directed control of its activity," explained Elena Rodina, assistant professor of the Department for the Chemistry of Natural Products, Faculty of Chemistry, MSU. Working with the model eukaryotic organism, thermotolerant yeast, the researchers determined the structure of one of the major domains of the telomerase catalytic subunit (the so-called TEN-domain) and found out which parts of it are responsible for the interaction of the enzyme with the RNA molecule and the synthesized DNA. Based on the experimental data obtained, the scientists constructed a theoretical model of the catalytic core of telomerase. The activity of the enzyme may be described in a simplified way as follows. Telomerase can be represented as a molecular machine containing an RNA molecule. This machine, with the help of a template part of RNA, binds to the end of a long chain of DNA, and synthesizes a fragment of a new DNA chain along the remaining template fragment. After that the telomerase machine has to move to the newly-synthesized end of the DNA in order to continue to build up the chain. According to the scientists' assumptions, the TEN-domain allows telomerase to synthesize DNA fragments of strictly defined length, after reaching which the RNA template should be detached from the DNA strand to move closer to its edge. Thus, the TEN domain facilitates the movement of the enzyme to building up a new region, i.e. the next telomeric fragment, and this is how the synthesis cycle is repeated. In addition, the researchers identified the structural core of the TEN domain, which remained unchanged in a variety of organisms, despite all the evolutionary vicissitudes, which indicates the important role of this core in the function of the enzyme. The team also revealed the elements specific for different groups of organisms, which interact with own proteins of individual telomerase complex. "The data obtained bring us closer to an understanding of the structure, function and regulation of telomerase. In the future, this knowledge can be used to create drugs aimed at regulating telomerase activity – either to increase it (for example, to increase the cell life span in biomaterials for transplantology) or to reduce (for instance, for immortal cancer cells to lose their immortality)", concludes Elena Rodina. The study has been carried out by the scientists of the Faculty of Chemistry and Faculty of Fundamental Medicine of Moscow University together with colleagues from Kazan Federal University, Skolkovo Institute of Science and Technology, Moscow Institute of Physics and Technology, European Molecular Biology Laboratory in Germany, and Rutherford Appleton Laboratory in the UK using the support of Russian Science Foundation (grant 14-14-00598).